MISSHA was one of the first Korean 'budget proof' brands to take the market by storm. The brand was established in 2000 and has now over 300 stores worldwide. It's the first Korean beauty brand to open flagship stores in Europe, recently in Germany. The philosophy of the brand is that quality shouldn't come expensive. You will find a lot of high quality products for affordable prices. The famous ones are the BB Creams, First Treatment Essence (dupe for the SKII essence) and the Time Revolution Night Repair Science Activator Ampoule (dupe for Eeste Lauder Advanced Night Repair, stat). I'm personally very impressed with MISSHA, so when I saw on eBay the Missha The Style Under Eye Brightener for 4 dollars I had to buy it! Concealers are probably the products we can't live without. I have significant discoloration and under eye bags but I guess I'm not the only one, we all need to conceal this dark panda circles ). The problem is that's it's always so difficult to find a good non drying concealer and the right shade. Many concealers have full coverage formulation so they tend to feel dry on skin and sit in fine lines, it can also be very obvious that your are wearing concealer. What MISSHA says:The Missha The Style Under Eye Brightener is a tip-type concealer that contains brightening properties to cover up your dark circles and imperfections. The concealer comes only in two shades 01 light beige and 02 natural beige. I got the 02 natural beige, the color is a good match for me, lucky ). After using it for a while I can say that the concealer works very well on dark circles. As you see in pictures below my dark purple under eye area is less visible and this is only one layer. The best thing is the brightening effect (not visible in pictures, couldn't capture it sorry), it really gives a shine and glow to that area, nicely reflecting and capturing light. The formula is light-weight but I find it a little bit difficult to spread, you have to tab it into the skin more than once on the same area (this is actually a well known problem with many concealers). The finish is very natural, doesn't look greasy. Verdict: I would recommend this product especially at the cheap price tag. This concealer is better for brightening than camouflaging dark circles. If you have very dark circles you still would need to use something with more coverage. 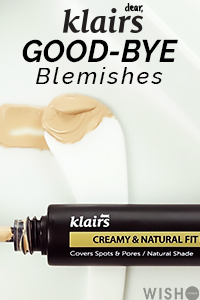 When I want more coverage I use other concealers, but this product comes on top for the brightening effect and it creates a natural finish :) I also tried to create Korean gradient lips with it and it worked great. Thanks ) nice blog I checked it out, following..